Good ski kit is notoriously expensive, desperately hard to keep clean and is unfortunately not always that great for the environment. The irony is the very kit you wear to enjoy the mountains is also contributing to climate change. All of the major brands are aware of this and doing everything they can to change it. However, a chance Kickstarter encounter introduced us to OpenWear. From the moment we watched their first product video we were hooked. Openwear use two different fabrics depending on the Jacket you buy. The OpenOne 3L series is made from 100% recycled PET bottles and has 45K waterproof rating while the FreeOne 2L is made from recycled Nylon and has a 20K waterproof rating. Both jackets are also PFC free but we will touch on that later. These fabrics can unlike other waterproof garments be washed without impacting their performance, so you can keep your kit clean and fresh. The product is made at Maxport Factory in Hanoi which produces products for the world’s leading sports brands. Finding ways to improve working conditions is a constant priority for Maxport. To create the best working environment for its employees Maxport arranges a huge benefits package. Employees are limited to one hour of overtime each day in addition to their standard 8-hour contract. Every worker is given social, health and unemployment insurance as well as 24/7 personal accident cover. They also get a free annual health check, weekly yoga classes and are all enrolled on a programme to improve their English, management and general life skills. Large glass doors and windows are utilised to make the most of natural sunlight along with the thousands of plants around the factory this creates a calming tropical atmosphere. Healthy lunches are sourced from the factories own gardens. If you are thinking of moving I can’t blame you, but it does not stop there. Each woman has 5 days paid leave for prenatal exams, 6 months paid maternity leave and a day-care allowance. Finally, the factory organises and donates to multiple charity events that can be arranged by employees. Many technical fabrics are made out of different plastic blends and then treated with a DWR (Durable Water Repellent) this prevents the outer surface of the fabric saturating and causes the water to bead and run off the jacket. Many DWR’s contain PFC’s (Perfluorocarbons). Last year, PFC-laced runoff from a DuPont’s manufacturing plant was blamed for major birth defects and other health issues in Parkersburg, West Virginia. Studies have linked exposure to the chemicals to testicular and kidney cancers, obesity and decreased response to vaccines, among other things. The consequences of PFC bioaccumulation are so serious that 200 scientists signed the Madrid Statement to express concern over the continued production and release of PFCs. Once released into the environment most PFCs break down very slowly. They can remain in the environment for many years after their release and are dispersed over the entire globe. At 439chf’s for a 45K 3L jacket the Openone is one of if not the best priced high performance technical jackets out there. Not only are the fabrics recycled they are recyclable. I don’t think we need to say anymore. That is a pretty big gamble unless you are really confident about the quality of your product. That all sounds great, but does it work? Short answer yes, the kit is amazing. We have tested it in everything from torrential rain to waist deep powder and warm ski tours. We are not the only ones who think this product is great. OpenWear won a Gold Medal at ISPO 2018 for the best Outerwear in the snow sports category. 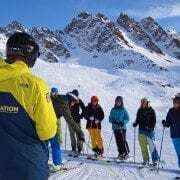 That’s why we are really excited to announce that OpenWear will be providing Jackets and Pants for our BASI Level 1 & 2 students in 2018. We will be doing a full review at the end of the season – so keep checking back to find out more.